ON A cruise ship with 2000 excited and rowdy holidaymakers for a week or more, who would have thought "escaping" was an option. But Princess Cruises' 77,000-tonne superliner Sun Princess promises to deliver just that over the next five months as Queensland's first and largest international cruise ship to be home-ported in Brisbane. The cruise line's motto is "escape completely", and media caught a glimpse of that onboard the ship - registered in Hamilton, Bermuda - during a press conference and tour to welcome her to Hamilton, Brisbane, on Wednesday morning. The beige-and-white-striped lounges, rolled signature towels, background orchestral music, market umbrellas and topiary trees of The Sanctuary makes the first port of call for passengers wanting to venture far from the madding crowds. This adults-only oasis on Deck 15 even has its own splash pool so a good book, some sun, and total peace and quiet will help you feel on top of the world. For a small fee, a sun lounge can be reserved for the entire duration of the voyage, or simply a half or full day. Drift away at the Lotus Spa during a revitalising massage and indulgent treatment, or put a little sparkle into the formal night with a makeover in the Beauty Salon. Exorcise your stress with some exercise on the jogging track and state-of-the-art gym facilities in the fitness centre. The fitness centre also boasts the alpha relaxation capsule - a white space age-looking "pod" that offers a super nap. Its 15 minutes "alpha relaxation" is said to be the equivalent of three hours' sleep. serenity of the Bay View Reading Room. The contemporary elegance of the staterooms and suites, intimate lounges, comfortable bars and quiet atrium seating areas makes them welcome retreats. If none of that appeals, a blue deckchair tucked away on the top deck, cooling off in The Riviera pools and spas, a seat at your favourite poker machine or pontoon table in the Grand Casino, a table for two in the Sterling Steakhouse or Verdi's Pizzeria, or a late-night drink in the Shooting Stars bar may be your idea of escape. Children need some "me time", too, so the dedicated kids' club is ideal, with programs and activities for groups from age three to teenagers - Princess Pelicans (aged 3-7), Shockwaves (8-12) and Remix (13-17) - including a disco and games arcade. 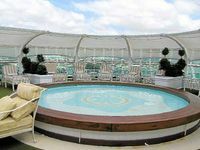 Princess Cruises was the first to put a big screen on the pool decks, and the Sun Princess Movies Under The Stars shows movies before they hit DVD and comes complete with comfortable lounge cushions, blankets and popcorn, of course. If that is not enough, try escaping completely while under a palm tree on your little patch of paradise in the South Pacific, getting lost in bargain-hunting in Bangkok or cleansing mind, body and soul in some Rotorua hot springs on a shore tour. In the tourism game, it's all about the numbers. And the number one and two came up a lot, as did the word "first", once Princess Cruises' Sun Princess arrived at 6am on Wednesday under the Gateway Bridge. The 261m-long ship made Queensland cruising history as the first and largest international cruise ship to be based in Brisbane. 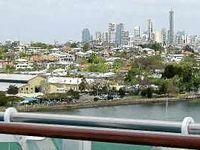 The fully booked Sun Princess also began the Australian cruising season for the first time ever from the state capital when she left later that day with almost 2000 passengers on a 42-night tour of China and Japan. In another first, two cruise ships will be based in Brisbane over the next five months as Sun Princess joins the smaller Pacific Dawn, from sister line P&O Cruises, which will continue to sail year-round from the city. The move reflected the growth in cruising holidays in general in Australia, and in Brisbane in particular, Princess Cruises commercial director in Australia Stan Birge told a press conference on board the vessel. He said cruising holidays had weathered the Global Financial Crisis better than most tourism sectors, referring to figures from the International Cruise Council Australasia's 2010 Australian Cruise Industry Report, which revealed that cruise passenger numbers had surged by a massive 27% last year, with a total of 466,692 Australians holidaying at sea, compared with 366,721 in 2009. The 100,000 passenger increase represented the largest hike in annual passenger numbers since the industry figures were first compiled nine years ago. Since 2002, the number of Australians taking cruise holidays has risen by 306% from 116,308 passengers to 466,692, achieving an average annual growth rate of 19%. "Australia is the standout success story in terms of cruising," Mr Birge said. Sun Princess will embark this season on 10 round-trip cruises from Brisbane to Asia, New Zealand and the South Pacific, welcoming a total of about 20,000 passengers. Mr Birge estimated that each time Sun Princess arrived in port, the state's economy would be boosted by $1million from the need to buy stores and fuel, as well as terminal fees and spending by passengers and the 900 crew in Brisbane and the Gold and Sunshine coasts. That represented $10million in total for the 10 cruises. "It's very exciting," Mr Birge said. He said the Sun Princess season already was selling very well, and sales also had begun for her return to Brisbane in October next year for a six-month cruise season. 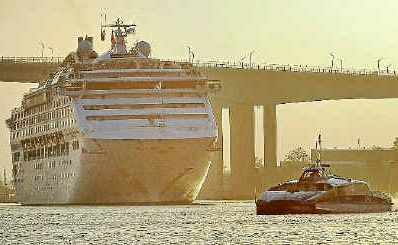 As talks continue with the State Government over improved infrastructure and access to Fisherman Islands for cruise ships, Sun Princess Captain Andrew Froude said narrow stretches of the Brisbane River and manoeuvring past tankers and the like on the busy, commercial river had posed the usual challenges when coming down the river into port on Wednesday. "They like to make it as difficult as they can for us but we make it look easy," he said. Her arrival marks the start of a cavalcade of cruise ships coming to Brisbane and other Australian ports Down Under this year - 12 in the Carnival Australia fleet alone. The Queen Mary 2 (February 19) and Queen Elizabeth (March 2) from Princess Cruises' sister line Cunard will make their maiden visits to Brisbane early next year. Contact your travel agent or visit http://www.princess.com for more information and bookings.